Journal of the House of Lords: Volume 5, 1642-1643. Originally published by His Majesty's Stationery Office, London, 1767-1830. Die Jovis, videlicet, 12 Maii. Dr. Hinton's, the Queen's Servant, Privilege. Message from the H. C. for a Conference about a Letter from the Committees at York, with a Message from the King. The Letter and Message from York read. Message to the H. C. for this Conference. Declaration concerning the Committees at York. Conference about the King's Message from York reported. Committees to meet, to prepare an Answer to it. Message to the H. C. to acquaint them with it. Lords Names to be delivered in, who have sent in their Commissions of Lieutenancy Captains Commissions. Thanks to be given to the City, for their ready Compliance to the Ordinance for the Militia. To put in his Answer. and with an Order for distributing the Money collected in Bristol. Order against killing the King's Deer, to be published. Sir George Strode's Impeachment read. Message to the H. C. with the Commissions for Captains of Foot. Message from the H. C. for the Lords to sit a while. Letter from the Committee of the H. C. in Yorkshire. Message from the King to both Houses. Hawkes to make Submission to Lady Dellawar. Bruton and Lenthall in Error. Message from the H. C. to be reported To-morrow. Thanks to the City, about the Militia. Ordered, That Dr. Hinton, the Queen's Servant in Ordinary, being arrested, contrary to the (fn. 1) Privilege of Parliament, shall be released and discharged of his Imprisonment. To desire a Conference, by a Committee of both Houses, touching a Letter received by their Speaker from the Committees at Yorke, wherein is inclosed a Message from His Majesty. That their Lordships will give a present Conference, in the Painted Chamber, as is desired. The Lord Keeper signified to this House, "That he had received a Letter from the Lord Howard, with an inclosed Message from the King to the Parliament." To desire a Conference, presently, in the Painted Chamber, touching a Message received from the King, sent up by the Lord Howard. That the House of Commons will give a present Meeting, as is desired. The Lords do declare, "That they are resolved to maintain those Lords and Gentlemen, Committees of both Houses, at Yorke, in those Things they have done, and shall further do, in Obedience of their Commands, for the preserving the Peace of the Kingdom." House adjourned during Pleasure, and the Lords went to the Conference; which being ended, the House was (fn. 2) resumed. 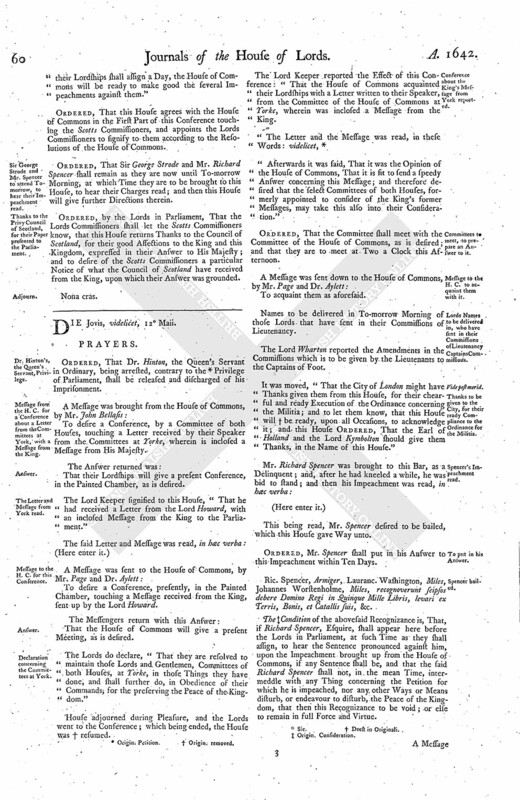 The Lord Keeper reported the Effect of this Conference: "That the House of Commons acquainted their Lordships with a Letter written to their Speaker, from the Committee of the House of Commons at Yorke, wherein was inclosed a Message from the King. 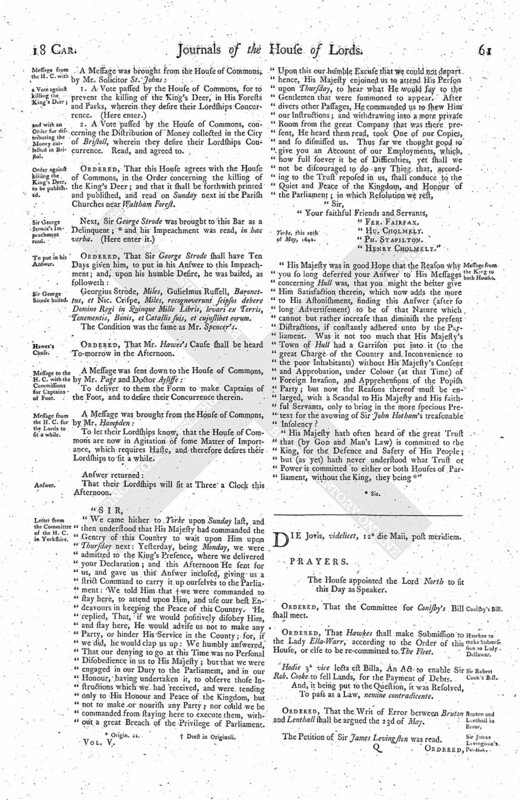 "Afterwards it was said, That it was the Opinion of the House of Commons, That it is fit to send a speedy Answer concerning this Message; and therefore desired that the select Committees of both Houses, formerly appointed to consider of the King's former Messages, may take this also into their Consideration." Ordered, That the Committee shall meet with the Committee of the House of Commons, as is desired; and that they are to meet at Two a Clock this Afternoon. To acquaint them as aforesaid. Names to be delivered in To-morrow Morning of those Lords that have sent in their Commissions of Lieutenancy. The Lord Wharton reported the Amendments in the Commissions which is to be given by the Lieutenants to the Captains of Foot. It was moved, "That the City of London might have Thanks given them from this House, for their chearful and ready Execution of the Ordinance concerning the Militia; and to let them know, that this House will (fn. 4) be ready, upon all Occasions, to acknowledge it; and this House Ordered, That the Earl of Holland and the Lord Kymbolton should give them Thanks, in the Name of this House." This being read, Mr. Spencer desired to be bailed, which this House gave Way unto. Ordered, Mr. Spencer shall put in his Answer to this Impeachment within Ten Days. Ric. Spencer, Armiger, Lauranc. Washington, Miles, Johannes Worstenholme, Miles, recognoverunt seipsos debere Domino Regi in Quinque Mille Libris, levari ex Terris, Bonis, et Catallis suis, &c.
The (fn. 5) Condition of the abovesaid Recognizance is, That, if Richard Spencer, Esquire, shall appear here before the Lords in Parliament, at such Time as they shall assign, to hear the Sentence pronounced against him, upon the Impeachment brought up from the House of Commons, if any Sentence shall be, and that the said Richard Spencer shall not, in the mean Time, intermeddle with any Thing concerning the Petition for which he is impeached, nor any other Ways or Means disturb, or endeavour to disturb, the Peace of the Kingdom, that then this Recognizance to be void; or else to remain in full Force and Virtue. 2. A Vote passed by the House of Commons, concerning the Distribution of Money collected in the City of Bristoll, wherein they desire their Lordships Concurrence. Read, and agreed to. Ordered, That this House agrees with the House of Commons, in the Order concerning the killing of the King's Deer; and that it shall be forthwith printed and published, and read on Sunday next in the Parish Churches near Waltham Forest. Georgius Strode, Miles, Gulielmus Russell, Baronettus, et Nic. Crispe, Miles, recognoverunt seipsos debere Domino Regi in Quinque Mille Libris, levari ex Terris, Tenementis, Bonis, et Catallis suis, et cujuslibet eorum. The Condition was the same as Mr. Spencer's. Ordered, That Mr. Hawes's Cause shall be heard To-morrow in the Afternoon. To deliver to them the Form to make Captains of the Foot, and to desire their Concurrence therein. To let their Lordships know, that the House of Commons are now in Agitation of some Matter of Importance, which requires Haste, and therefore desires their Lordships to sit a while. That their Lordships will sit at Three a Clock this Afternoon. Yorke, this 10th of May, 1642. His Majesty was in good Hope that the Reason why you so long deferred your Answer to His Messages concerning Hull was, that you might the better give Him Satisfaction therein, which now adds the more to His Astonishment, finding this Answer (after so long Advertisement) to be of that Nature which cannot but rather increase than diminish the present Distractions, if constantly adhered unto by the Parliament. Was it not too much that His Majesty's Town of Hull had a Garrison put into it (to the great Charge of the Country and Inconvenience to the poor Inhabitants) without His Majesty's Consent and Approbation, under Colour (at that Time) of Foreign Invasion, and Apprehensions of the Popish Party; but now the Reasons thereof must be enlarged, with a Scandal to His Majesty and His faithful Servants, only to bring in the more specious Pretext for the avowing of Sir John Hotham's treasonable Insolency? His Majesty hath often heard of the great Trust that (by God and Man's Law) is committed to the King, for the Defence and Safety of His People; but (as yet) hath never understood what Trust or Power is committed to either or both Houses of Parliament, without the King, they being (fn. 8) "
The House appointed the Lord North to sit this Day as Speaker. Ordered, That the Committee for Conisby's Bill shall meet. Ordered, That Hawkes shall make Submission to the Lady Ella-Warr, according to the Order of this House, or else to be re-committed to The Fleet. Hodie 3a vice lecta est Billa, An Act to enable Sir Rob. Cooke to sell Lands, for the Payment of Debts. And, it being put to the Question, it was Resolved, To pass as a Law, nemine contradicente. Ordered, That the Writ of Error between Bruton and Lenthall shall be argued the 23d of May. 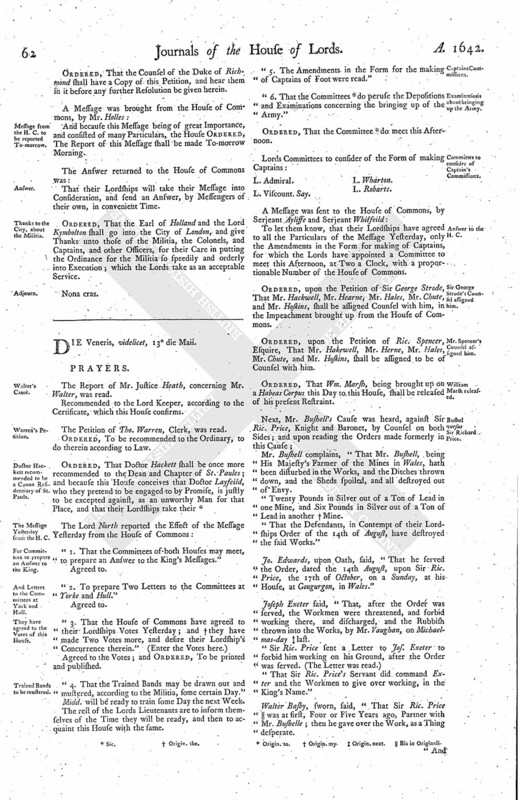 The Petition of Sir James Levingston was read. Ordered, That the Counsel of the Duke of Richmond shall have a Copy of this Petition, and hear them in it before any further Resolution be given herein. And because this Message being of great Importance, and consisted of many Particulars, the House Ordered, The Report of this Message shall be made To-morrow Morning. That their Lordships will take their Message into Consideration, and send an Answer, by Messengers of their own, in convenient Time. Ordered, That the Earl of Holland and the Lord Kymbolton shall go into the City of London, and give Thanks unto those of the Militia, the Colonels, and Captains, and other Officers, for their Care in putting the Ordinance for the Militia so speedily and orderly into Execution; which the Lords take as an acceptable Service.